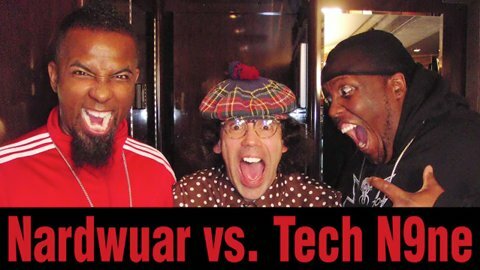 Nardwuar vs. Tech N9ne made the list of HipHopDX’s “8 Entertaining Moments of Nardwuar Vs. Hip Hop” amongst the likes of Nardwuar’s interviews with Nas, Jay-Z, Pharrell, Ghostface Killah, Machine Gun Kelly and more. Rather than being a “Best of” list, HipHopDX’s list is one full of “memorable moments” ranging from “hits to misses”. From the dismissal of Nas to the nonchalant air of Jay-Z to the “Wow” response from Tech N9ne and Pharrell, Nardwaur has definitely patented a style of interviewing that is all his own. With artists who have as rabid a fanbase as Tech N9ne, routine interviews done during tour-stops tend to convert the unititiated rather than satisfy the cult. But a Nardwuar interview in “Vancouver, British Columbia,” is an entirely different beast where ephemera and anecdotes that even the artist has forgotten are unearthed. If Jay-Z’s 10 minutes were all over the place with little accomplished, Tech N9ne who joined Pharrell in declaring “greatest interview ever” had an exchange with Nardwuar that mirrored the Kansas City emcee’s rhymes: head spinning efficiency topped with a twisted smile. You get the story of Tech choosing to open up for EPMD rather than attend his high school graduation followed by a discussion of James Lemonade, Mac Dre and a lawsuit from Bill Withers over sampling rights. Then there’s a surprise video message from the original “Dirty Rapper” Blowfly and a K.C. Hip Hop history lesson featuring Tech’s first group, Pure Dope. As if this wasn’t enough Krizz Kaliko joins Nardwuar and Tecca Nina to talk The Munsters and participate in the longest recorded “ending freeze.” Game, set, match, Strange. What did you think of the interview and what do you think of Nardwaur?